Very good quality but little bit small. Love these small wraps for avocados, tomatoes etc.Can be washed easily. So much better than plastic wrap. Love these wraps for so many things. Part of apples, avocados or covering up small bowls or ramekins. Really reduces my Saran Wrap usage. Also keeps my foods fresher than using plastic wrap. Love the wraps, mine have lasted over a year. Amazing! Love these wraps.. super easy to use, keeps food fresh, and gets you way from all that single use plastic! Started with the small wraps and now have them in all sizes. Love it! I also bought other sizes and it really helps to keep food fresh. I love the Abeego line... all of the sizes! This size is super practical to wrap cut apples, avocados, etc. I've had our first package for over a year, and it's just started to show its age. Love them! So handy for fruit, cheese, bowls... Just bought my second pack. Love these! I bought assorted sizes. I use one in particular for onions as the onion smell does not wash away. The seal is fantastic and I feel good using them. Not buying plastic wrap again. Ordered small medium and large. Small is great for small items like lemon or small bowls. I ordered the large, medium and small food wrappers. I have yet to use the small size. I've used the medium size to wrap left over food in a glass Tupperware. It works fine, with a strong smell of beeswax. It does not affect the taste of the food. It does leave a film of beeswax on the glass, but nothing that won't scrub away with hand-washing in warm/hot water. The only downside is that I read on the box, that it will last one year or longer. It's quite pricey if it only last one year. Will have to see. This product is awesome, it even keeps my guacamole fresh for days! Wish I would have found it sooner. I have almost completely made the switch in many of my day to day "saran" uses, and have made my friends all devotees as well! Love these products for small things like cut veges and fruit. For cheese, I tend to leave the plastic wrap from the store on but seal it with one of these wraps. For veges and fruit, I just use the wrap straight on them and it's great! No messy plastic that doesn't stick anyway! While I love the wraps for small bowls, I won't use them for cheese again. 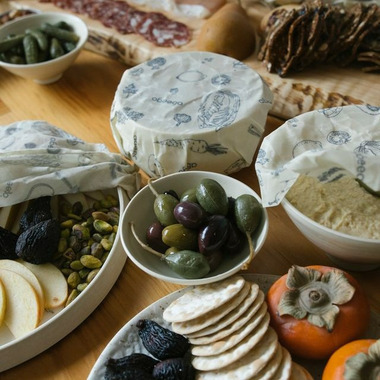 I bought a selection of cheese for a wine tasting party and wrapped them up after with these wraps; each of the cheeses ended up infused with the flavor of beeswax. It made for an odd flavour profile. Verdict: would not buy again. They look pretty, but the impart a waxy flavor on anything they touch. These wraps are everything they claim to be. Great for wrapping small items (cheese, fruit, etc) and covering dishes going into the fridge. I'm happy they can now be ordered by individual sizes and have purchased additional of the small ones since I use these most. I find them easy to clean and store them wrapped (several together) in a clean towel in a kitchen drawer.